Review: "Arena: Pepper's Ghost" - Sea of Tranquility - The Web Destination for Progressive Music! Until now, Arena's The Visitor and Lion's Cage CDs have been their definitive albums. Then along came Contagion, and a far heavier sound in which Arena seemed to have one foot in the prog-metal camp. Now, with Pepper's Ghost, the band has merged both - the heaviness of Contagion, and the progressive symphonic, melodic sounds of the earlier releases. And the result is stellar! Solid songwriting with hooks that will catch you on the first spin, excellent guitar work, and vocals that have been criticized by many in the past but work remarkably well here. "The Eyes Of Lara Moon" is a bit mainstream in nature, but it's the most catchy piece on the CD and you might find yourself humming it more often than you'll care to admit. "Opera Fanatica" has caricature snippets of operatic voices included in various points, wrapped into a wonderful 13 minute mini-epic that will have you reaching for the replay button. Apparently the title refers to a ghostly illusion projected via glass reflections, and the lyrics are peppered with themes of mis-perceptions of images. David Wyatt's excellent cover art and sleeve-design reflect the band in the role of Victorian comic book characters, which is unusual and quite fun. Considering Mick Pointer's involvement, it's no surprise that fans of Fish-era Marillion will love this music. All of the best characteristics of that genre of are present here, in the context of modern progressive music. Pepper's Ghost is probably Arena's crowning achievement to date. 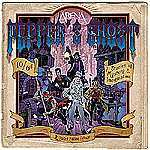 As with every other album in their discography, Arena have definitely wandered into different sounding territory with Pepper's Ghost. This album is more linear compared to the band's previous records Immortal and The Visitor. Pepper's Ghost is a more song-oriented and straightforward release with more emphasis on guitars than keys and intricate arrangements. The songs have a big warm sound with multi-part choruses, great hooks, catchy melodies and solid compositions. Rather than compare this relase to the band's past efforts, I have to mention the similarities to Paradox-era Royal Hunt in Rob Sowden's vocal harmonies, some Carved in Stone-era Shadow Gallery and the undeniable Threshold influence thanks to Karl Groom. Interestingly, producer and keyboardist Clive Nolan takes a back seat on this release and gives guitarist John Mitchell more playing space. The almost 10-minute piece "The Shattered Room" displays smooth melodic playing from Mitchell; his guitar wails in the run-out section of the song as Clive Nolan joins him with various colours of sound on his keyboard. It's one of the best songs on the album, dealing with multiple personality crisis on a lyrical level. Each member on this album (as shown on the cover art) personifies a certain Victorian comic hero and the album explores themes of insanity and confusion throughout. Correspondingly, "Tantalus" is a piano ballad which was inspired by Clive Nolan's interest in Greek mythology, yet the song will first catch your interest due to its rapid change of rhythms and Mitchell's articulate guitar playing. Vocalist Rob Sowden's vocal lines have been toned down on the album; Sowden sings lower but the huge multi-part choruses really give his singing a push. "Smoke and Mirrors" is the perfect example showcasing these huge choruses, which are no doubt Threshold-influenced melodies. You need to check out Threshold's Subsurface album if you want more of this kind of track. The last song, "Opera Fanatica", is the longest song with epic touches. It is also the most progressive piece as it draws from contrasts between melody and rhythm adding a good dose of atmospheric elements to the songcraft. "Purgatory Road" is the heaviest composition with its almost invisible keyboards and mercilessly searing guitar work, while "The Eyes of Lara Moon" contains an unforgettable acoustic vibe and an emotional vocal delivery. It could be argued that the songs on Pepper's Ghost are too simplistic, and never employ any complex song structures, but on the other hand, this record gives John Mitchell and Rob Sowden a good opportunity to push the band in different directions musically. It is true that this album is more on the melodic rock side of the equation with proggy overtones here and there, but still, most Arena fans are going to like this because of its melodic and symphonic orientation. I personally still like Immortal, The Visitor, and Songs from the Lions Cage better, but Pepper's Ghost is a much welcome addition to Arena's back catalog. Well, it's been a few years since I've felt this way about an Arena album. Don't get me wrong, Contagion, and Immortal were both fine releases, but perhaps a bit more in the prog-metal camp than Arena should have traveled. Pepper's Ghost is a return to the early 80's symphonic neo-prog sounds that the band hit a home run with on albums like Songs From the Lions Cage, Pride, and The Visitor. John Mitchell's guitar work still packs a punch throughout this CD, but his searing & melodic fretwork add a more hard rock approach this time around, and paired with the wonderful keyboard textures from Clive Nolan make for a classy prog-rock marriage that supports these seven tracks quite nicely. There's lots to love here, like the dark "Tantalus", the epic keyboard sounds of "The Shattered Room", or the extended prog journey of "Opera Fanatica". Singer Rob Sowdon puts in another fine performance with his powerful vocals, and drummer Mick Pointer and bassist Ian Salmon anchor the rhythm quite effectively. An early pick for Prog CD of 2005?